Visitors to Monmouth will see a new addition to town in the form of artwork celebrating the well-loved cattle market. Monmouth is one of 79 communities to be involved in the Sustrans national social history project The Portrait Bench. The Portrait Bench project aims to recognise and remember inspirational individuals in towns across the UK. 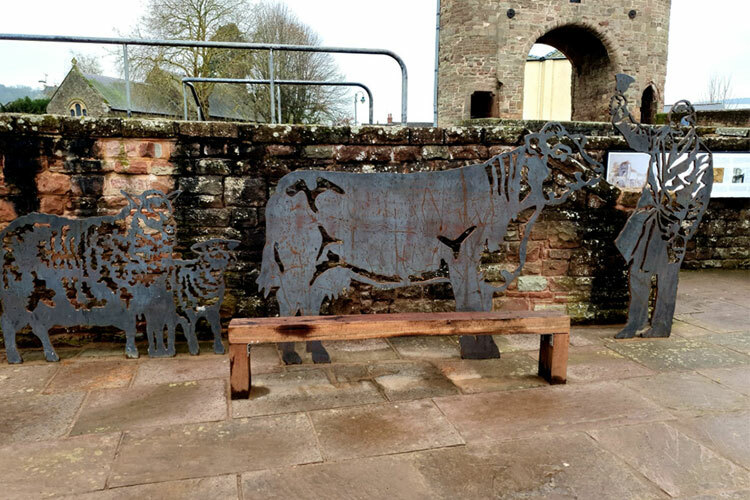 In Monmouth, Jim Shankland (the auctioneers assistant for agricultural estate agents/ auctioneers known then as Rennie Taylor and Till, and today just known as Rennies) along with Welsh Mountain Sheep and a Hereford Bull have been commemorated in three life size steel portraits. Life-size figures have been cut from sheet steel and installed by a simple bench which encourages locals and visitors to sit or step up into the space and become a part of the portrait. The bench is located at the southern end of town on the old livestock market site. The features of each character have been simplified while retaining their essential characteristics. The characters reflect those things that are important to the community and celebrate the uniqueness of each location. The characters were chosen by the Monmouth Links Steering group from a list of suggestions put forward by the public. Communities across the UK nominated local people for the contribution they have made to local life, culture or history to become the figures on their local Portrait Bench to be part of a collection of over 250 portraits.